Hey, I like the new Trek films, as well as the classics! I heard that the ship in the 2009 movie is significantly bigger than the original (I guess it would have to be to fit some of those ridiculous interior spaces). 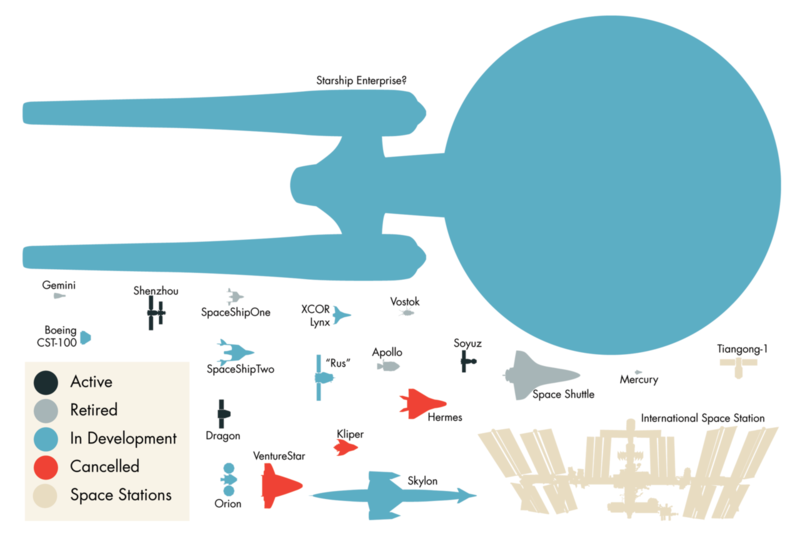 Instead of removing it, wouldn’t it be much more interesting to add the original enterprise alongside it so that their scales could be compared as well. I don’t mean to put too much sci-fi into something that’s supposed to focus on real spacecraft, but it would be cool. Pingback: Light Friday: Is Swearing Hurting Your Career? Pingback: Where’s my flying car? I believe the CST size is also off. It should be a bit smaller. For space stations, don’t forget MOL, Liberty and the theoretical chinese station for 2020 timeframe :). What about the Ares I-X? Please add it. Thank you. As much as I’d love to, the Ares I-X isn’t a spacecraft. It’s a launch vehicle. In other words, it wouldn’t fit on this diagram, and I don’t want to start adding rockets, because there are a lot which I could include! Remember, it’s a silhouette. The wing area is fairly large, but the vehicle itself is quite small. All the same, if you think I’ve drawn it the wrong size, please feel free to help me find a technical document or specification with the planned dimensions. In fact, I’d love it if someone could verify it for me (someone already pointed out an error in the size of VentureStar). Serenity would really be nice. Serenity… Again, it’s about fact rather than fiction, so I’d rather not tbh. A scale bar is an interesting idea though. While relative sizes let you compare, it’s true that a scale bar would give an absolute measure. In case you were wondering if a Mercury capsule could fit inside your bathroom. (Incidentally, chances are it probably could. It was small enough… And metric would kinda make more sense, but if I was making a scale bar, I suppose I could do both. Considering your quality as a man of science, I’m disappointed to see that you may lead people to think that these spaceships and stations are real. Who ever heard of “Soyouz”, “Apollo” or “Shenzhou” to name a few ? 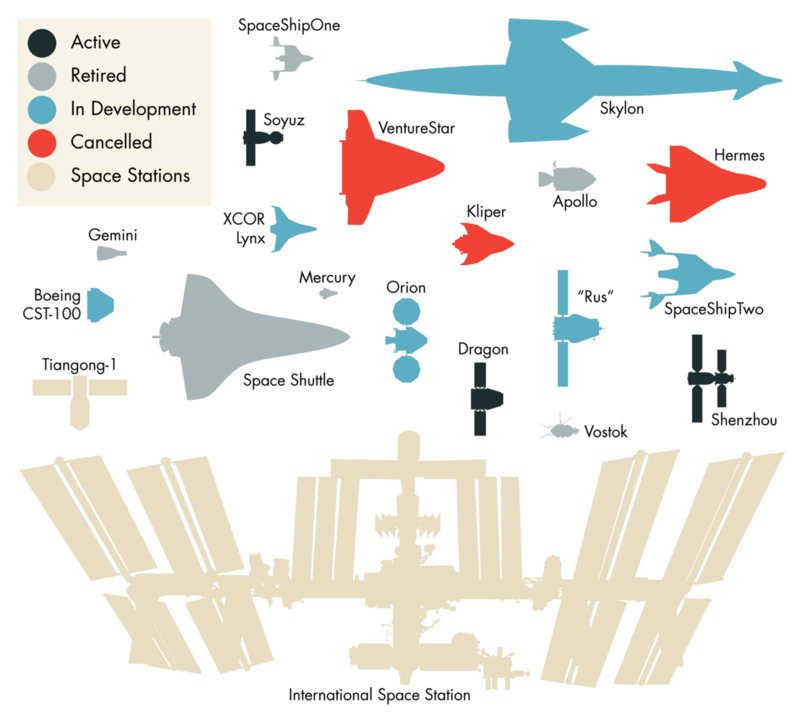 Wouldn’t it be more educative to draw the real world space ships ? Like the Serenity, the Battlestar Galactica or the Nostromo ? Oh gotta go now, nurses found me out. I’ll have to go back to the padded cell. Haha! Well, you know. We can’t have people believing that things like Soyuz are real. Who knows what might happen! 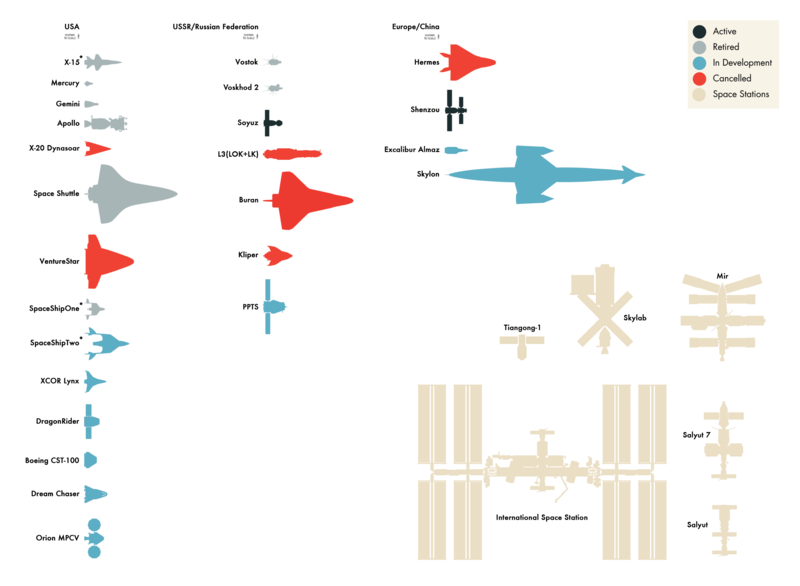 Seriously though, I don’t want to add any more fictional starships. The point to this was real craft – the internet has enough comparisons of fictional ships already. Since you added the Dragon Capsule, please also add the ATV (Automated Transfer Vehicle): http://en.wikipedia.org/wiki/Automated_Transfer_Vehicle!